The glass coffee cups is very lightweight. Somebody said it maybe made from plastic, but actually not! It is true glass! Sweese provide a 30 days warranty, that if anything goes wrong about the product within 30 days, will replace the item at no cost to you. Add Sweese Coffee Mugs to your kitchen collection now! QUALITY GLASS & DOUBLE WALL DESIGN - Sweese glass mug is make of high borosilicate glass that would be more lighter and durable than common glass . And even more, double-walled cups, keep hotter and cooler than ceramics mugs, the glass is cool to the touch. You will never burn your hand on a hot beverage! TAPERED SHAPE AND ELEGANT LOOKING - The flared lip of glass cups that makes the cups easier to pick and hold without spilling. And clear glass allow to clearly see the interior and exterior walls of the cup when you fill the cup with a liquid. Well wrapped in a box, the attractive look would make a nice gift. 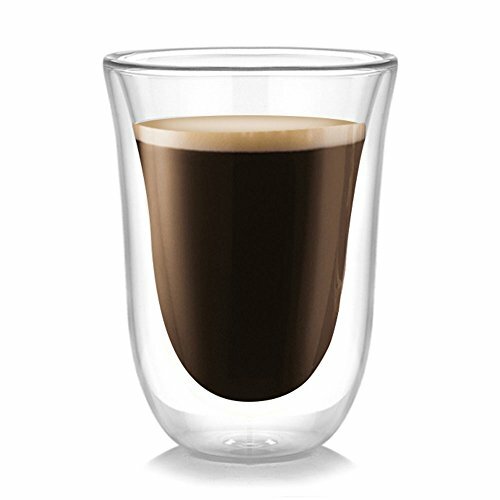 SUITABLE SIZE ADN SAVE SPACE - The glass cups hold 8 oz to the rim, suitable for espresso machine, perfect for cappuccino, latte, cream, tea, kinds of beverage. It is allow to stack that will help you save space. EASY ENOUGH TO CLEAN UP - Nicely built, espresso mugs feel so smooth and sleek. Therefore, it is very easy to wash with soap and water, leaving no dry spots. Plus they are dishwasher and microwave safe.